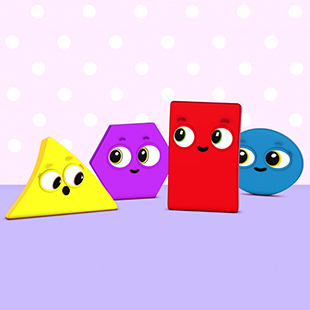 “Shapes School” is a 3D animated series, that’s all about learning shapes! Every morning, all shapes come to school happily. Circle, square, triangle, rectangle, star, trapezoid, hexagon, oval – are all here. In each episode, 4 chosen shapes will be starring. A “door” in the wall, shaped like one of the shapes will open, allowing only the matching shape to get in. Other shapes will try getting in and fail. Once the chosen shape enter the “room”, it will meet various objects that are the same shape. Each episode will end with an object made up of 2 of the shapes, so your child will get a chance to see how shapes are actually all around us! See what time Shapes School is playing!